Brent Haberli drives for a bucket at Sevastopol High School Jan. 14. Photo by Len Villano. 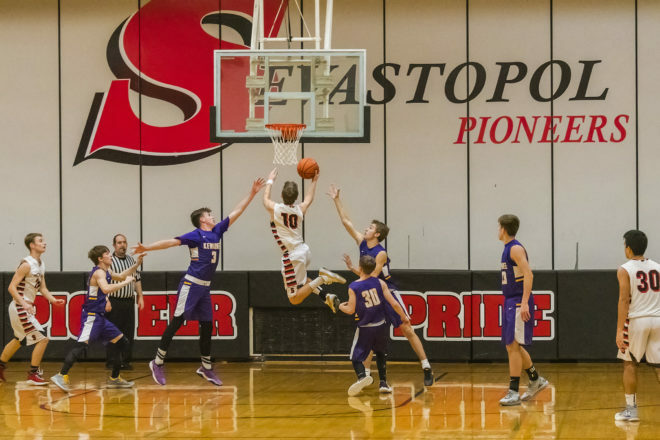 Forgive Robbie Pollman if he doesn’t appreciate the significance that Jan. 31, 2013, holds for the Sevastopol boys basketball program. Don’t be shocked that coach Andy Symons does. That was the night when the Pioneers defeated Gibraltar 50-48 to improve to 2-9 in the Packerland Conference. What was conceivably an innocuous conference win at the time was the beginning of a long journey to the next one. Fast forward to Jan. 7, 2019, and 80 consecutive Packerland Conference losses later. Sevastopol defeated Algoma 70-43 to pick up a long-awaited win, and now Pollman has joined Symons in noting the significance of the victory. Robbie Pollman. Photo by Len Villano. 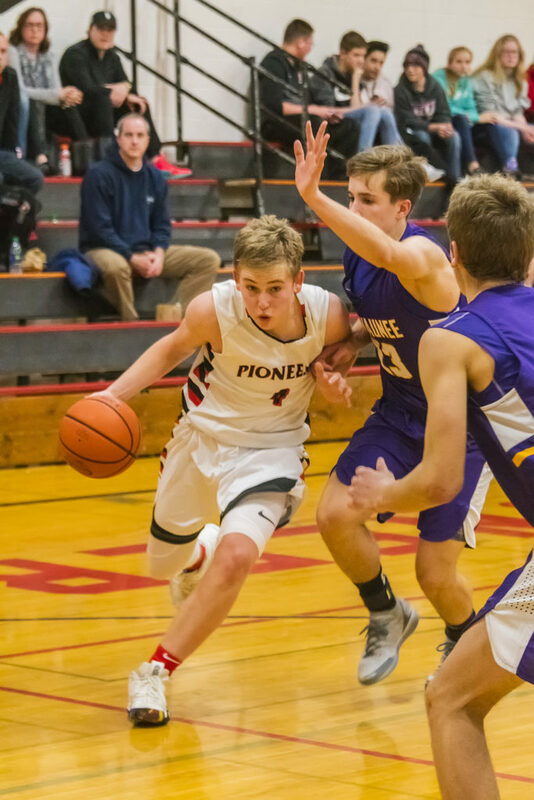 Pollman scored 22 points in the Pioneers’ win against Algoma. The five-foot-10-inch junior is the Pioneers’ leading scorer at 18.3 points per game after leading the team in scoring as a sophomore, with 12.1 points an outing. Pollman has scored in double figures in all but two games this season, including a 34-point outburst against Stockbridge in the Lena Holiday Tournament. Symons said his team is playing with confidence right now and is looking to pick up some more wins going into tournament play. Sevastopol followed up the win over Algoma with a tough two-point loss to local rival Gibraltar on the road. Any team that goes almost six years without a conference win is bound to have at least a handful of close losses. The Pioneers led 12-2 Peshtigo by five points at halftime, only to lose by three points. Peshtigo is 7-1 in the conference and sits just one game behind Southern Door for the league lead. Burress and Motkowski both said Sevastopol’s program may be on the upswing, and with four out of the six top scorers returning, it would be hard to disagree. Brent Haberli (14.5 points per game), Johnny Jorns (6.5 ppg) and Arthur Hocevar (3.7 ppg) will provide much-needed experience and depth along with Pollman next season. The Pioneers will need to find replacements for seniors Vidal Rosales and Eddie Garcia, who combine to score 10 points and grab 13 rebounds per game.